Everyone makes this mistake once in their career – they forget something they need to make their time successful and effective. It never fails that something is left so make a list and check it twice. Bring business cards. First and foremost, make sure to bring tons of business cards because you are going to hand out a ton of them. It is probably easiest to grab the entire box in your desk drawer – better too many than not enough. Make sure that you take relevant notes on the back of the business card so that you will remember your conversation and the opportunity when you are back in the office. Have a gimmick. If you are planning to have a booth in the expo part of the conference, be sure to have a creative element that draws onlookers (potential customers) to want to know more about your product or service. It does not have to be an expensive giveaway item-- instead something that makes them take notice. Demonstrations and interactive displays are the best and always engage people. A never-empty bowl of chocolate never hurts either. Why does candy taste so good at these conferences? Trade shows and business conferences are goldmines when it comes to networking. Where else can you meet so many people who are like minded or in similar businesses as you? This is a huge opportunity to meet tons of people that can help you at some point whether it is offering ideas to help grow your business or introducing you to influential people. Be approachable and assertive. When meeting people, it is important to be approachable to those who come up to you and be assertive by making the first move and introducing yourself (this is where you need so many business cards). For introverts, it may force you to step out of your comfort zone and be uncomfortable, but nothing else makes a more positive impression on others. As you end a conversation, hand that person a business card – that is unless you are very high-tech and do that phone to phone thing to swap information. Send emails. Once you return from the conference, be sure to send follow up emails to let those with whom you spent any time know that you enjoyed meeting them. Always Learn Something New. It is so important to return from a conference with at least one important take away. Not only are business conferences a networking mecca, they can also provide tons of opportunities to teach new ideas and invigorate your attitude. This can translate into gains for the entire office. So make sure that you share more than free pens and squeeze balls when you get back to the office with your colleagues. Plan Your Time. Most conferences like the Vacation Rental Management Conference have huge agendas which makes it hard to do everything. Since many events have their own websites, take time to plan your time -- go over the list of meetings, courses, and discussion ahead of time so you can decide what you want to attend. It is always a good idea to plan breaks throughout the week for unexpected issues that may arise at work and so that you can get together for coffee with potential customers or schedule appointments with clients who might also attend. You know the old adage: plan your work, work your plan. It is never truer than at a conference. Attend Social Gatherings. Social gatherings are excellent ways to wind down at the end of the day. Not only can you meet new people in a relaxed atmosphere, you can possibly talk with key note speakers one on one, reconnect with those you meet throughout the day and enjoy some easy-going conversation. It is always a worthwhile reminder not over indulge at the bar. There is nothing wrong with a glass of wine or beer, but keep in mind, you may want to do business with these people or even want to work for them one day so everything in moderation. Business conferences do not have to be an inconvenience. There are tons of ways to get the most out of them. Set some goals you want to achieve and work to accomplish them while there. It may surprise you that you come away with more knowledge about your industry and even have a little fun in the process. 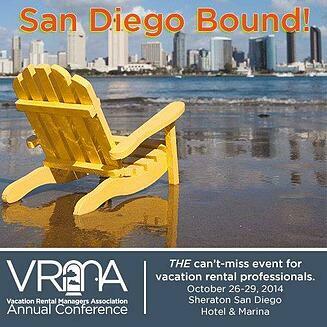 Barefoot will be attending the National VRMA conference in San Diego, October 26th-29th in San Diego. For more information, click here. We look forward to seeing so many of our colleagues and friends during the show.